The Makita XCUO2Z 18v cordless chainsaw is a fairly small and handy chainsaw that is almost capable of delivering power on par with the majority of bigger models, thanks to the chainsaw’s dual 18V batteries that deliver a total power of 36V. But does this make the Makita the best small chainsaw ever? 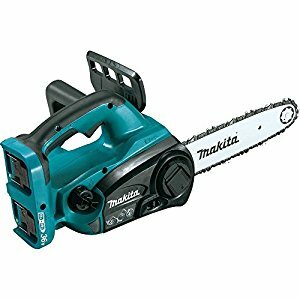 Why is Makita the Best Small Chainsaw? The Makita XCU02Z is equipped with a motor that delivers 1650 FPM, which helps increase cutting speed. There are a couple of 18V LXT lithium-ion batteries that deliver run time and power for corded requirements without disconnecting from the platform. The chainsaw’s operating noise level is fairly low at 89 dB(A) and the guide bar is at a comfortable 12 inches. For operation and maintenance convenience, the chain adjustments can be done without tools. The battery mechanism means there is no need to change engine oil, replace spark plug, or clean the muffler or air filter. Also, there is no need for draining fuel for storage. The chainsaw is ready to be used right out of the box. Star Protection Computer Controls (a Makita creation) helps the battery and tool to exchange real-time information and monitor the chainsaw when in use to safeguard against over-discharging, overloading, and overheating. The machine is electric, which means it’s unbelievably quite even when trimming trees or cleaning up fallen branches. If your neighbor is sleeping while you’re working with the saw, you are unlikely to wake him up. Another positive of being an electric device is that it doesn’t emanate horrible gas fumes and smell. The Makita XCU02Z is a simple, easy-to-operate, and safe machine that even kids can use under parental guidance. The standardized anti-kickback chain ensures the machine won’t kickback ever. The two batteries are positioned strategically inside the case, making sure the saw is well-balanced and easy to handle. Also, there are inbuilt battery gauges, which makes it easy to determine whether there’s enough juice left. The Makita XCU02Z is not the least expensive chainsaw ever. If you’ve set your eyes on this, price should not be a yardstick. The cordless functionality may not be up to everyone’s liking. People who want continuous use for hours may not be happy with the fact that the battery won’t last too long. However, average users don’t use chainsaws for such elongated time periods. Therefore, the majority won’t be complaining much. Replacement blades may be a tad difficult to find. However, a bit of looking around should get you what you need. Despite having a small frame, the Makita XCU02Z is not just potent and flexible, it’s also not a fuss to use. Unlike other chainsaws in its category, the XCU02Z comes with a lot of unique and proprietary features such as Star Protection Computer Controls, 3-year warranty on the battery, etc. that signifies the level of energy and investment that has gone into making this tool. If you’re looking for the best small chainsaw, it doesn’t get any better than the Makita XCU02Z.